Rounding off a two-match week, Wolfsburg picked up their second 7-0 win, this time over Leverkusen as fellow promoted side ‘Gladbach fell to Hoffenheim. 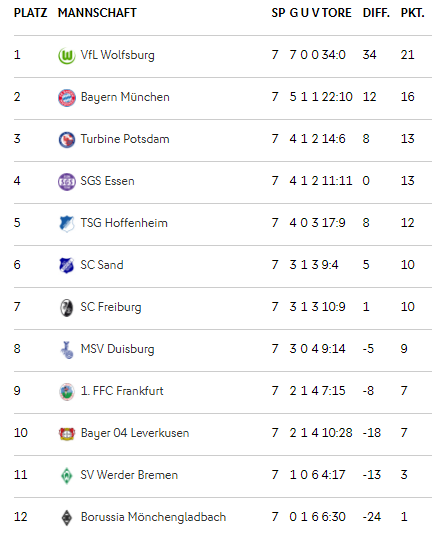 Elsewhere Sand picked up a win at home to Duisburg as Frankfurt saw off Bremen and Bayern and Potsdam claimed 2-0 respective wins over Essen and Freiburg. Still just scoring for fun, Wolfsburg wasted little time against Leverkusen, taking the lead through Pernille Harder in the first minute. Comfortable in the match but not comfortable on the scores until ten minutes before the break when Kristine Minde brought the errant ball down before firing it home at a corner. The match already out of sight at half-time following Ewa Pajor’s goal late in the first half, the Pole extending the advantage from a tight angle five minutes after the restart. Four soon became five as Sara Björk Gunnarsdóttir rocketed the ball into the back of the net from 20-yards out. The goals only getting better as the match wore on, Pajor’s hat trick completed two minutes later with an audacious bicycle kick before Harder made it seven with a rising header. Looking for consistency, the Zebras found little joy at the Orsay Stadion, falling to defeat at the hands of Sand. 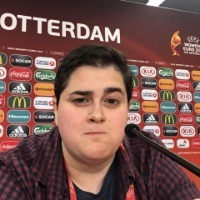 Two teams likely to be battling for places come the end of the season, there was little to separate them, Jana Vojteková’s 13th minute curler enough to decide the tie and keep all three points in Willstätt. Given a new lease of life at Frankfurt and scoring for fun since moving to Hesse, Laura Feiersinger took her tally for the season up to three ten minutes before the break, turning home Jackie Groenen’s parried effort. The lead held until eight minutes into the second half when Katharina Schiechtl converted an uncleared corner. The match decided 13 minutes from time when Laura Freigang got off of the mark for her new team, rising well to nod Groenen’s dinked cross in at the far post. Already looking good money for a top five finish, TSG continued to improve their lot, changing up through the gears at home to see off 'Gladbach. Lena Lattwein’s tenth minute goal the start of another long day for the visitors, Kelly Simons’ solo effort late in the first half bringing the team back into it although they were dealt an instant blow with Simons getting injured whilst scoring and needing to be replaced. Unable to hold onto a draw for long, the Foals were soon a goal down when Nicole Billa danced through the box and wrapped the ball into the hungry net. The second half brought about more of the same with Lattwein adding a third just after the hour with a superb strike after an equally as tasty backheel from Maximiliane Rall. Three became four seconds later when Leonie Pankratz calmly slotted a penalty home, rubber-stamping the victory. Still not quite firing on all cylinders, the Esseners came up shorthanded against the Bavarians, unable to convert after having a first half goal ruled out for a foul on Manuela Zinsberger. The visitors up a goal after the hour when Sara Däbritz pinged a header over Kim Sindermann before Fridolina Rolfö put the gloss on with a low effort that slipped away from the goalkeeper. Still looking like they’re missing some of their recent departees, the Turbines got back on track with a win over a misfiring Freiburg side. The hosts on the board 12 minutes in when Gina-Maria Chmielinski cut-back for Svenja Huth, the attacker with time and space to curl the ball into the far side of the net. A goal to the good but not on safe ground against Jens Scheuer’s young team, it wasn’t until after the hour that the hosts had some breathing room. Opening her account for the season, Johanna Elsig pounced to send an uncleared corner passed Merle Frohms, wrapping up all three points.